I recently discovered Jason Pearsons fantastic visualizations at his TRUTHstudio website. TRUTHstudio is a consultancy that provides research, analysis, strategy, visualization, and communication support. In the projects presented, Jason focuses primarily on direct and indirect environmental impacts along industrial supply chains. In the below example he features a segment of the food supply chain with the sectors “feed grain”, “meat animals”, “meat packing” and “eating places”. 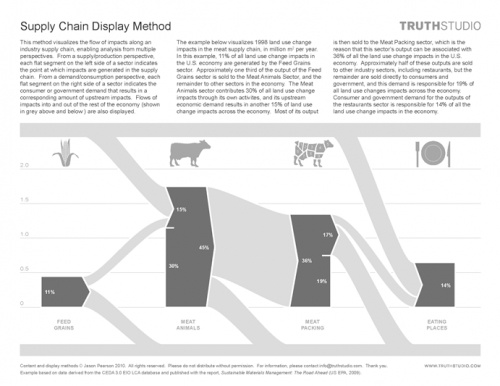 The above supply chain is displayed with its land use change impact (such as transformation of forest to pasture). The unit is million square metres per year. The scale is shown on the left and the nodes are stacked on the bottom zero line. Hence the height of the node indicates the magnitude of land use change (in Mio m²) caused by this particular segment’s activities. Additionally the nodes have a flat side on the right, for the percentage of their activities that are directly delivered to consumers or government, and an arrow shaped exit when the services are delivered to another sector of the economy. 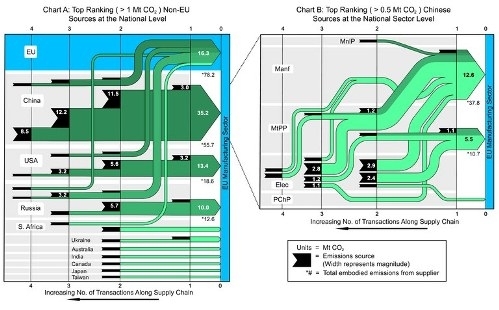 On the left edge the flat bottom segment indicates the environmental impact caused directly by the activities of this segment, while the connected arrow represents the environmental impacts caused by this segments activities in other sectors across the economy. The grey bands at the top and at the bottom represent all other sectors of the U.S. economy. 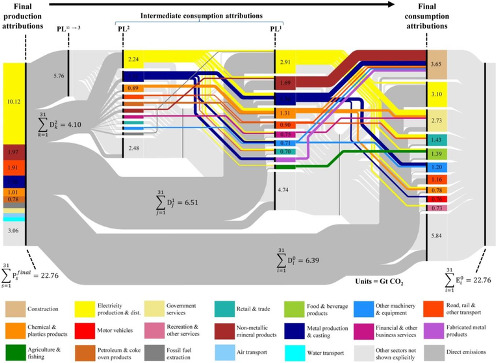 So we have three persepctives with in one Sankey diagram: direct sector impacts, indirect (or intermediate) impacts, and final consumption impacts. This is a fascinating concept, which is used by Pearson to create an overall map of the U.S. economy, or, to be more precise, maps of environmental impacts caused directly or indirectly across the nation by industrial activities. These so-called “Economy Maps” are featured in my next blog post.